In a recent discussion on why chess players are happy to take short draws in tournaments, Michael Basman suggested that people become serious chess players as an alternative to hard work. If that is the case (and I'm not agreeing or disagreeing with the observation), then it may explain why the world is not full of millionaire chess players. Not through hard work, but 'smart' work, in the area of high finance. The New York Times has an article on financial companies hiring chess players to make smart investment decisions for them, although if I recall correctly, this already happened in the 1990's. The article contains a couple of success stories (GM David Norwood is interviewed) but I guess I'm a little surprised that more high profile examples aren't given. It leads me to think that the strike rate of successful chess player-traders is no higher than non-chessplaying traders. Although I've decided that CC and online turn based chess isn't going to result in the dramatic improvement that I hoped, I still play the odd game now and then. I am in the middle of a mini-match (2 games), while wearing my PNG hat on chess.com, with 1.f3! the mandated opening move. This is the Gedult Opening, named after David Gedult, although Thomas Barnes played it 100 years earlier. Opening theory on the Gedult is a little sparse, with 2.Kf2 being the most popular continuation, after almost any Black reply. Obviously the line 1 ... e5 2.g4?? is to be avoided, while Gedult himself used 1.f3 as a way of tricking his opponent into a Blackmar-Diemer after 1. ... d5 2.e4 dxe 3.Nc3. Knowing nothing of this I simply went for development as Black and won quickly after keeping my opponents king in the centre. Not a classic by any means, but a good example of development versus non-development. When I was younger someone told me that you can be more productive if you wake at 4:30am and work for 3 hours, than if you wait until 9:30 pm and then start working. Having spent last night (between 11pm and midnight) staring at a keyboard trying to write something for this blog, I tend to agree. However the notion of doing *anything* before 1pm is an anathema to most chess players, especially early morning games. Most of the big overseas tournaments I've been to seemed geared towards the 'late start, late finish' schedule, with players happily sacrificing a reasonable dinner time so they don't have to eat breakfast at a reasonable time (Just about every Olympiad I've been to starts with breakfast scheduled from 7:30am to 9:00 am, only to have it extended to 11:00 am by the start of round 2). So I did not blog last night before I went bed. The benefit of this is that I can at least write something about the Grand Slam Masters final that isn't 18 hours out of date. Having a quick look at the live games, I see that Vallejo Pons, who started with 2 losses has beaten Carlsen in the third round. I've only had a quick look at the game but Vallejo had to defend for a lot of the middlegame, but then was a piece up, which was enough to then win. You can play through the game (for now) from the tournament livegames site. The 2011 Grand Slam Masters Final in Sao Paulo started with a win by Aronian, as well as an interesting game (result wise anyway) between Anand and Carlsen. Aronian was paired with Vallejo Pons and seemed to pick up a huge advantage in the opening, which he converted into a kingside attack. Vallejo managed to avoid being mated, but ended up with a lost ending anyway. The Anand v Carlsen game was a solid draw in the Berlin Ruy Lopez, but the main interest was in what it meant for both this tournament and future ones. Anand's choice of 1.e4 may be a deliberate strategy to disguise his opening repertoire for his upcoming World Championship match, while Carlsen's choice of the Berlin showed he was content to start the event with nothing more than a draw. The front page of today's Wikipedia had a link to an article on Philip M. Parker. His claim to fame is that he is the author of 107,000 books (according to Amazon), although he claims it is more like 200,000 books. He achieved this seemingly impossible feat using computers, databases and web searches to generate the content of each book. Of course this approach could be taken to write chess books, and in fact such books already exists. I have a few books, from the 1980's/90's, which could be considered 'database dumps', although such books are not looked upon highly. Then while searching for something else this evening, I came across a book which is much closer to a 'generated' book. The provocatively titled 'The Final Theory of Chess' was written with a bank of computers running Fritz 7 (plus later versions). It is essentially an opening manual with a vast number of lines that end with a computer evaluation. There has been some human input, but as the author admits, this 'was kept to a minimum'. Nonetheless, what the book is trying to achieve (an attempt to push the boundaries of opening analysis) is made redundant by the very technology it employs. Why use a book, when you can achieve the same outcome with your own computer. Of course you don't get an understanding of the opening, but the book did not offer one either. On the left of this page are links to various things, included other chess blogs I read. At the top of the list is the Closet Grandmasters Blog. It was the first successful Australian chess blog, and was probably the most widely read, up until this year. Last year, work commitments saw the Closet Grandmaster head off to Japan. Then this year saw a few other issues (earthquakes, tsunami's) make it harder for the Closet Grandmaster to blog. Indeed, this silence caused some concern amongst some regular readers. Well I'm pleased to say the Closet GM is still around, although he is not blogging so much. Instead he is posting quite regularly on another platform, Google+. While chess look like it is now a lower priority, he is finding a lot that is interesting about contemporary Japanese culture. Of course his audience is smaller, but when Google+ moves away from the invitation only mode it is now in, I'm sure his readership will once again increase. Sadly my returns at this years Lifeline Bookfair have been pretty poor. Some years there are an abundance of quality chess books, and at other times (like now) there have been very few. However I did pick up all 5 volumes of "Australian Cricket" by Jack Pollard. as well as a few other books I've been looking for over the years. Of course there were the usual large number of Contract Bridge books (my theory about the mortality of Bridge players still stands), as well as sudoku/crosswords etc. I'll give it one more go tomorrow, otherwise I'll hope for better rewards next year. No not HAL, although it does have something to do with chess. C.A.L. stands for Computer Assisted Learning, although the term seems somewhat dated these days. But back in 1988 it still carried some meaning. One arena for CAL was chess, and Saitek (chess computer manufacturers) produced a book that helped you improve your chess, with the assistance of their flagship Kasparov brand chess computers. Basically you played through games in the book (which were also stored on the computer), and tried to choose the correct continuations. At the end of the game you were given a performance rating based on the number of correct answers. Fairly standard stuff these days, but pretty clever for 20 years ago. The study games were all famous games (Opera Box, Larsen v Spassky, Torre v Adams etc) with one possible exception. 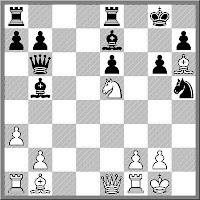 For the game involving Kasparov, his games against Karpov, Polugaevsky etc were passed over in favour of the game shown below. Not one of Kasparov's strongest opponents, but a nice hack nonetheless. A few years ago I mentioned the Vega Swiss Pairing Program. One of the nice things about it is that is free to run under Linux, although you have to buy a licence to use it with Windows. Since my first mention it has gone through a number of improvements, and just recently Version 6 was released. The other great thing about Vega is that it doesn't use 1 pairing system, it can use a whole lot of them. The Dutch, Dubov, Lim, USCF and a couple of other systems are included. You can also write your own pairing engine and use Vega as the interface, which is something I have almost finished doing myself. It can be downloaded from the developers website. If you want to check it out, either run it under Linux for free, or use the restricted version (30 player maximum) under Windows. Travelling between tournaments can be hard enough on the system, but travelling within tournaments makes even less sense to me. It has certainly happened a few time throughout history, but it seems to be more prevalent in recent times. The 2011 Grand Slam Masters Final, which starts in a few days, is split between Sao Paulo in Brazil, and Bilbao, in Spain. There is a 4 day gap between the two halves of the event, but even then, having to travel between continents may disturb a players equilibrium. The record holder for such travel, at the highest level at least, would certainly go to the AVRO Tournament in 1938. Every round was held in a different city/town in The Netherlands, with players often having no rest days on which to travel. Of course The Netherlands is a small country, but moving about would make preparation hard. In Australia, probably the best example of this system (multiple venues), would be the Victorian State Championship, which is shared between a number of clubs in Melbourne. At least in that case the players do not have to change accommodation between rounds, although I suspect work and commuting schedules would still cause some angst. The years European Club Cup has 65 teams, including a number with an *average* rating of 2690+ Obviously these teams are likely to win, but further down there are other teams who might make it interesting. Team 23 is simply name "Perfect" , while one of the English teams may be giving away their opening secrets by calling themselves "e2e4". In fact there are a few teams from the British Isles (White Rose, Nidum, Gonzaga) but despite the popularity of the 4NCL competition, these teams are towards the back of the pack. While none of these teams are likely to be in the running for the medals, I'm sure there are still bragging rights to be had, based on their final placings. Click on the above link for results and games. Having avoided talking up Peter Svidler in the 2011 World Cup, for fear of sabotaging his chances of victory,, I am now happy to say he has defeated Alexander Grischuk 2.5-1.5 in the Final. Having won the first game in the 4 match series he drew the next 3 games to win by the odd point. The third place playoff between Ivanchuk and Ponomariov ended with the same result, in Ivanchuk's favour, after their 4th game also ended in a draw. I'm less and less convinced that getting chess on TV is important, but only because getting anything on TV is becoming less important. The thought occurred to me today while I was surfing the sports channels. One of the channels was showing the European Table Football Championships (yes the game with the twiddling of knobs), which was being reported in with solemnity and breathlessness of actual football. Now nothing against Table Football, and those taking part looked very serious, but it seemed that the fact this was being broadcast indicated a dilution in what sports were now making it to TV. I suspect this dilution is caused by the increase of the number of broadcast channels, and not just the traditional ones. It also shows that the control over what is to be broadcast is moving away from the broadcaster, and towards the content provider. Broadcasters are becoming much more passive, accepting content from third parties. So where does this leave chess? On the one hand, sports channels are less likely to put there own resources towards covering chess. One the other hand, they may be more likely to show a pre-packaged product, if it is put together right. But if the product is packaged specifically towards TV, then it actually may suffer in quality. A better option would be to take advantage of the 'new' technologies and develop a product that operates on the web. There may even be an added benefit in this approach. As traditional TV loses its viewer base to the internet, more and more TV may head in that direction (both in terms of content and delivery systems). And when they get there, chess may already be waiting with just the right product. The 2011 World Cup has now reached the Final, which for now I'm ignoring, lest I jinx one of the players taking part (see this recent post for a partial explanation). Alongside the Final is the 3rd place playoff, which carries some importance, as the winner of this match, between Ponomariov and Ivanchuk, will qualify for the next Candidates series. Tonight's game saw an interesting opening line, which contains a rather clever trap. First played in 1990 (Lobron v Polgar), it starts with 13.Nxe6. The only problem with it is that it such a good sacrifice, no one has ever accepted it [13...fxe6 14.Rc1 Qe5 15.Rxc8+ Rxc8 16.Qxd7+ Kf8 17.Qxc8+ Kg7 18.Qd7+ Kh6 19.g3 just wins for White]. In the 9 games in my database, Black has automatically declined it. Even worse for White, is the fact that it scores miserably. 7 wins for Black versus 1 win for White isn't a good advertisement for the line. So Ponomariov's choice of this line was a real surprise, although the fact that he lost less so. "How many different games of chess are there?" was a question I was asked at the Amaroo School Chess Club the other day. Clearly the question was about the number of possible games played using standard rules, as opposed to the number of variants. In fact I do not know the answer to either question, but I'm certain that the number of variants is substantially less than the number of possible games. One possible answer is the Shannon Number, named after Claude Shannon. He estimated a minimum of 10^43 possible positions (not games), although this included illegal positions. If we treat different sequences of moves that lead to the same position as distinct game, the number of games increases to 10^123, which is more than the number of atoms in the universe. So while I don't have an exact answer for my class next week, I can at least tell them it is a very big number! Of all the current young Australian chess players, FM Max Illingworth would be the most frequent rider of the emotional roller coaster. I've seen him score some joyous tournament victories and witnessed some of his devastating losses. His current overseas chess journey started out not looking so good, but ended on a high, with Illingworth scoring his first GM norm. Playing the the September First Saturday Tournament in Hungary, Illingworth scored 7/9 for a 2600+ performance rating. He started with 3 wins over GM's in the first 4 rounds, before finishing with 2/2 to score the norm. Flipping through today's TV guide I became quite excited at the discovery of a show called 'Pawn Stars'. "Have to watch that" I said to the wife, who simply gave me a dirty look in reply. "No, not that sort of show" I continued, "P-A-W-N Stars. Surely it must be about chess"
But of course it wasn't. It was about a real Pawn Shop, where people borrow money against the value of items they put up as collateral. Apparently it is quite a popular show, but not so interesting for me. However, to make up for missing out on a bit of chess on TV, here is a video that GM Ian Rogers alerted me to. Chess Wars! Doing a little research I've decided that there are essentially 4 ways to checkmate your opponent is 5 moves or less, from the start of the game. Of course there are variants on these themes and even a combination of ideas (eg 1.e4 e5 2.f4 Bc5 3.fxe Qh4+ 4.Ke2 Qxe4#), but the general approach is limited. As for the names Fools and Scholars Mate are well known, although most people refer to Scholars as "The four move checkmate". The "Touch Move" label comes from the story that under old rules of chess, if you touched a piece that could not move, then you had to move your king instead. In the example game, Black went to play Nc6 on move 2, but picked up the Bishop on c8 instead, and was forced to move his king to e7. I couldn't find a name for the last mate, but was tempted to christen it "Alekhine's Mate" after a famous version of it in a simul he once gave. The traditional methods of improving at chess (hard work, study, lots of play) can be time consuming, with no guarantee that they will actually work. While trawling through a list of academic papers on chess I realised there may be a couple of other approaches to improving your results. The third, and possibly most promising, is a study that showed the higher your testosterone levels, the better your results. It wasn't that testosterone was only responsible for better physical performance (as previous studies had shown), but that when the physicality was removed, as in chess, it still resulted in better performance. A preview of the article is at http://www.jstor.org/pss/2786687 although the full article has to be purchased to be read. Canberra does not have much of a Spring. Normally we have Winter until early October, Spring happens on a Thursday, and then Summer starts. The only thing that differentiates August from September weather wise, is that it is a lot windier in September. This is particularly cruel on those that play Street Chess at this time of the year. As part of the generous sponsorship agreement with have with Chicken Gourmet and King O'Malleys ($5000 a year), come the 1st of September we move outdoors ("If they can play outdoors in Moscow, you can play outdoors here" is the advice from the sponsor). And today happened to be one of the coldest Saturdays I can ever remember. It was probably warmest at 10:30 am (half an hour before the start of the tournament), and got progressively colder as the day progressed. To a man we attributed our poor play to the cold, with a number of queen hangings and mate in 1's testament to this claim. By the end I could barely remember my openings and reeled of this novelty. 1.e4 e5 2.Nc3 Nf6 4.Bc4 Nxe5 5.Qh5 Nd6 6.Bb3 g6? Similarly afflicted, my opponent failed to notice the hanging e pawn and retreated the queen to f3. I had at least the sense to now play 7. ... f5 and eventually won the game. The 2011 FIDE World Cup is down to 8 players, and maybe the length of the event is beginning to take its toll. Today saw the first game of the quarter finals, and most of the games were over pretty quickly. Two of them were drawn in under 20 moves (one was a perpetual), another took a little longer to finish wit the same result, and only 1 game was decisive. This was Ivanchuk's win over Radjabov, which is given below. Playing through the game I wonder what players from 80 years ago would think of it.. The hyper-moderns might appreciate Ivanchuk's play (7.Nde2, 13.Rc1), but the more classical minded might frown at some of the manoeuvring. But from move 28 onwards I suspect they would be in agreement that White had emerged with a winning position. FIDE have released a whole raft of documents that will be discussed at the upcoming FIDE Congress. While most of the documents are fairly routine, there are a couple of ones worth reading. The audited accounts for 2010 are there, with the big dollar item being 900,000 euros in legal fees (the stoush over the 2010 election being the cause). Also listed are some financial proposals, as well as changes to the Swiss Pairings Regulations. The documents can be found here. It is worth noting that as this is a non Olympiad year the FIDE Congress will only have meetings for the various FIDE Commitees and the Executive Board. This means that federations do not have delegates at this Congress (only when the General Assembly meets). However Zonal Presidents are members of the Executive Board, so Oceania Zone President Brian Jones at least gets to vote on behalf of the region. Of course if a Federation (like PNG) has members on the various FIDE Committees, then it is still worth sending someone along. One of the most visited pages on this blog is my 2007 review of the Cheeky Dream USB Chess Board. Basically I panned the product, deciding it was both junk, and expensive junk. However someone decided it might be a useful tool after all, and decided to make something out of it. Bryan Whitby has used the USB board and turned into a reasonably cheap DGT board. He has documented the entire process, which you can look at on the USB Chess Board webpage. Also worth noting is that the popularity of my review has attracted a lot of spam comments to that particular blog page. So if you do visit the original article, be warned. The Oceania Chess Confederation (of which I am the Treasurer) has been pretty busy lately, organising a number of activities in the South Pacific. The current event is a FIDE rated Round Robin in New Caledonia which, like previous events in Palau and the Solomon Islands, is designed to allow local players to achieve FIDE ratings. Three Australian players have made the trip to Noumea, Lee Jones, Tony Weller and event organiser, Gary Bekker. A couple of the local players already have FIDE ratings (via the French Chess Federation) and hopefully they will be joined by a few more. Early results from the event are here, and full results should be available in a day or two. There is also a tournament coming up in the Solomon Islands, while on the organisational side the OCC will be organising another arbiters seminar, in Queenstown in 2012. Importantly, the OCC have been able to attract financial support for these events from both the Asian Chess Confederation and FIDE. There are also plans to hold some larger events, like the Asian Seniors Championship in the next year, with a number of member countries being considered as likely hosts. I was going to do a big post about the Moiseenko Navara incident from the third round of the World Cup. For those not familiar with it, Navara made contact with two of his own pieces while playing a move, and Moiseenko claimed he had to move the King, which was a blunder. Navara instead moved the piece he had always intended to, but the issue played on his mind so much, that when he had a forced mate, he instead offered a draw. The post I'd intended would have ended with the suggestion that asking the arbiter for a ruling would have been the more sensible solution. However, it turns out that Navara did ask the arbiter for a ruling, and the arbiter informed in he could play the move he intended. Based on the information that has come to light after the game (including video evidence) was the correct ruling (as Navara only bumped his king while picking up the bishop). So while it is clear that Navara did know the rules, whether Moiseenko did is not so clear. Immediately after the game some commentators were praising the good sportsmanship of both players, but for me this is either a case of Moiseenko being ignorant of the rules, or indeed engaging in 'sharp practice'. What would have been good sportsmanship, given that arbiter made the correct ruling, was for Moiseenko to accept that his incorrect claim affected the outcome of the game (and match), and offer to resign the match. As it turns out Navara did win the playoff section 3-1, so at least the right result was arrived at. Sure it was only a rapid tournament, but it was still very strong, and Viswanathan Anand can be pleased with finishing 1.5 points ahead of Karmnik and Aronian. Anand score, who 4.5/6 while Kramnik and Aronion were on 50%. As for the 4th player, nothing went right for Magnus Carlsen finished on 1.5/6, losing all 3 games on the second day. In the Womens Rapid Viktorija Cmilyte finished in 1st with 4/6, while Anand and Koneru teamed up to win the novelty tandem blitz event. The Botvinnik Memorial, which is currently being held in Moscow, is trialling a new feature. At various stages of the game, the clocks are stopped and one player takes to the microphone to explain what is going on. While this is happening, the opponent enters the 'cone of silence' (actually a set of ear muffs), so they cannot hear their opponents plan. While this is interesting, to me it seems a trifle clumsy. If the organisers are interested in broadcasting the players thoughts, then an alternative would be to have them permanently wired for sound. Then the players could chat away to their hearts content, explaining ideas as they go. The trade off would be that the players would have to play in separate areas, using computers to transmit their moves to their opponents. The other requirement might be a '3 second' delay on the commentary, to allow the producer to bleep out any "WTF?" reactions from the players! I discovered the following fact in a book by Reuben Fine, which I picked up at a second hand bookshop. Edward Lasker invented an improved version of the Breast Pump. This invention made Lasker a great deal of money, but the downside was that friends began to refer to him as "the chest player". While my regular chess club (at the Australian National University) currently has somewhat cramped accommodation, it does also have a big screen TV, which I can hook my computer up to. This comes in handy to either display the draw before a round, or to show live coverage from a tournament such as the current World Cup. Last night I had a look at a couple of games before deciding on Fier v Morozevich (which Morozevich eventually won). I figured that there was a high probability that any game involving Morozevich would look good on the TV, and it turned out to be so. As we were packing up after the round, one of the club members wondered why Morozevich was on a low-ish board. The simple explanation was that while Morozevich has been one of the top players in the World, on the back of some dominant tournament wins, there have also been the not so good results. As a consequence his rating tends to move up and down, and as of yesterday was in the down cycle. A day later however, and Morozevich is back on the up cycle. He gained 43 rating points in the last rating period, and moved from 48th place up to 17th (on the September FIDE rating list). Given the sometimes glacial nature of the FIDE ratings system (especially at the top), this is a pretty significant change, and would have shifted him up a substantial number of boards if his new rating was used to seed the World Cup. Here is the second Morozevich v Fier game from the second round of the World Cup. Fier's impetuous 11. ... e5 turned out to be the losing move, as after 13.Qa4+ the obvious 13. ... Bd7 gets hit with 14.Rxd7! 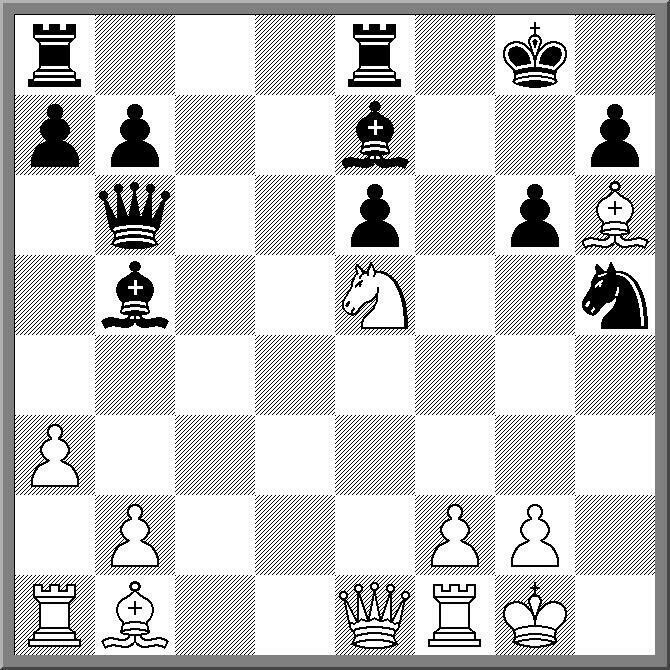 Nxd7 15.Nd5 and White has an overwhelming attack.